Christmas is the perfect time to get some preparedness gear under your tree or give some to someone you care about. And today I have the second half of the 12 Days of Christmas gift giving set–Preparedness Gear 12 Days of Christmas! Pick a loved one or unsuspecting neighbor and treat them to a little preparedness this Christmas. I’ve got a listing of the items below with some suggestions for what you could give. I tried to make this adjustable for different budgets by not specifying an amount on anything so you can give something small or something larger–your choice. 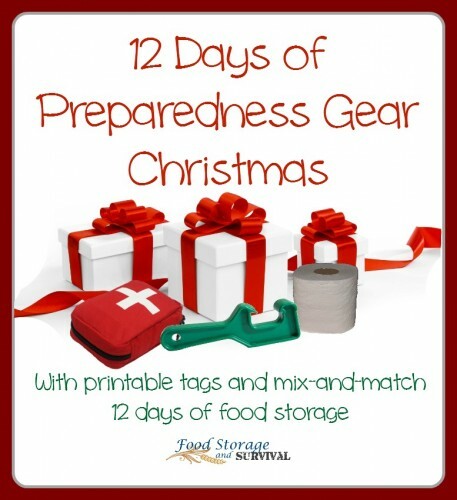 And the Preparedness Gear 12 Days of Christmas coordinates perfectly with the Food Storage 12 Days of Christmas. These two sets are designed to mix and match so you can do all food storage or all gear or some of each to fit your needs and your budget! I want these to be usable, so in the tags, I even left the day number blank so you can arrange them however you want. You can copy the images from this page and make them any size you want OR I have a printable PDF file here that has them ready to print 6 to a page! All because I love you and want to help spread preparedness to all your friends this year! So here’s the 12 Days of Christmas, Preparedness gear style. On the day of Christmas, To be prepared indeed, For washing and for drinking, Some water’s what you’ll need. Give a case of water bottles, or a water storage container or filter. The straw type of filter is fairly inexpensive. You could even do water purification tablets. On the day of Christmas, For warming hands and feet I’m sure that you’ll agree These hand warmers can’t be beat! Give hand warmers, either disposable or reusable, singly or by the case! On the day of Christmas To mend a tear or split, We’re adding to your prep supplies This handy sewing kit! Give a sewing kit. The pre-packed ones are okay, or you can put together one of your own! See my short list of essential off grid sewing supplies for some ideas. On the day of Christmas, We’re adding to your kit. Here’s some little goodies To get a fire lit. Give matches, either regular or waterproof, or a lighter or other type of fire starter. 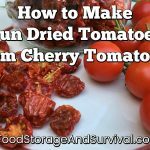 You could also get some fire starting helps like WetFire or make some dryer lint firestarters. On the day of Christmas, We think it would be swell, To store some dust masks just like these To keep you breathing well. Give N-95 dust masks. You can order these online or get them at your local hardware store. You could also get them from a medical supplier. On the day of Christmas, We’ve brought you some TP. You know you need to store a bunch For an emergency! Give toilet paper! A single roll, four pack, or jumbo pack! On the day of Christmas, For emergency hygiene, Some soap in your storage Will help to keep things clean! Give any form of soap–liquid or bar hand soap, laundry soap, dish soap, some type of cleaner, shampoo, etc. On the day of Christmas We thought it would be cool, To add to your emergency supplies This handy little tool! This one is wide open to any kind of tool you want to give. Maybe a knife or multi tool or bucket opener or gas wrench. On the day of Christmas, When things get a little tricky, You’ll find a lot of uses For some duct tape that is sticky! On the day of Christmas Some light will help you see When all the power’s out And there’s no electricity! Give a flashlight, headlamp, light sticks, or candles. On the day of Christmas, We know you’ll benefit From dressings and from bandages Found in this first aid kit. Give a first aid kit. Small ones can be found by the bandages in most stores, or go for something a little more complete! On the day of Christmas Some rope will be just right, For lashing and for hanging And for tying things up tight! Give some rope or cord. You could also give paracord and if you’re feeling really fancy, make a paracord bracelet! Remember, these can be used in any order and match the Food Storage 12 Days of Christmas, so you can pick and choose from both sets to make your 12 days! Enjoy spreading some preparedness this Christmas! This is a great, I love it! Thank you! Both these lists are fantastic Angela! I’m linking to them in my newsletter tomorrow. THANK YOU!